A visit with G. Hodder is always illuminating. We sampled cheese and nuts on the back deck with a drink or two while his stereo speakers showed ample evidence that Randy Bachman is better than ever: an enjoyable hour or two of a waning Toronto summer. 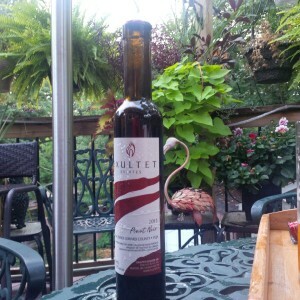 We shared two cans of beer, local pale ale and IPA, and then a half bottle of Exultet fortified pinot noir was brought out, result of his recent wine tour in the Prince Edward County area. 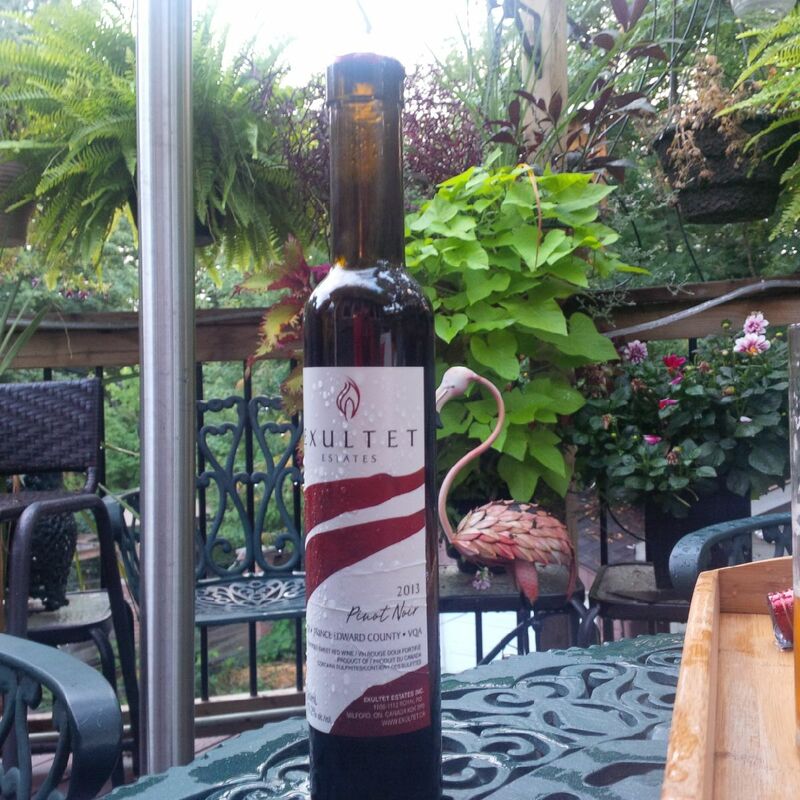 Exultet is a highly regarded boutique winery in the County and this wine is in a style of its own though port seems the closest analogy. Brandy is added to a pinot noir and the result is a lightly sweet, very flavourful dessert wine although a small amount went very well with a little cheese before dinner. I’m not sure how the sugar gets in, either the grapes were late-harvested or perhaps some sweetening is added, either way the melded tastes were very successful, a perfect illustration of terroir. I could recognize the earthy note pinot acquires in our northern lands but the brandy and sweetness made it into something rather different. Tasting and reporting of it here are an illustration of how the “et seq” in our blog title works: one thing leads to another and anyway all fermented drinks are related, or all drinks tout court. It was a reminder to try to get out to the County soon. There is no better time as the harvest and grape processing show the wineries in their most active phase. Gary, thanks for stopping by!